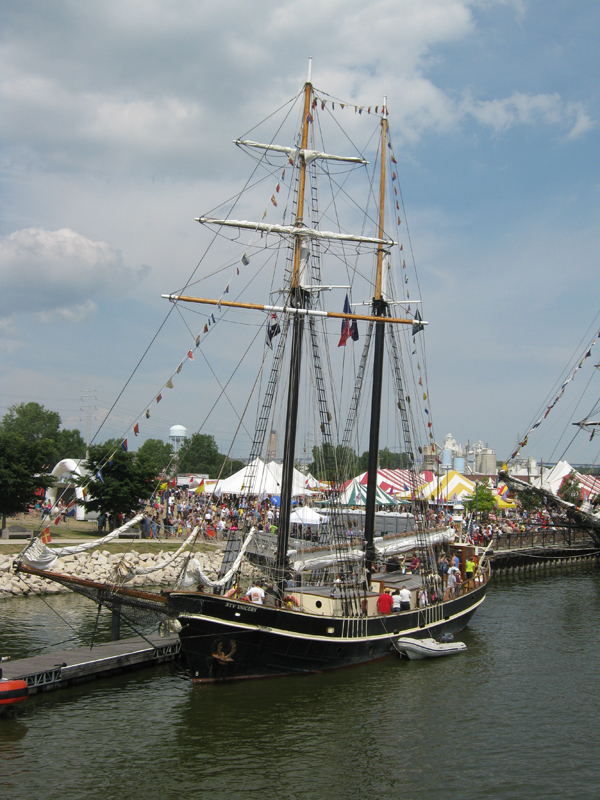 Last weekend, I had the opportunity to attend the Tall Ships Festival. I have loved ships for as long as I can remember. As a child, my mother and sister and I toured a reproduction of the Santa Maria, but since then the closest I’d been to tall ships has been seafaring stories, films, and paintings. I love a good pirate story, or pretty much anything set on a ship in the 17th or 18th Centuries. Raphael Sabantini’s novels (which I highly recommend). James Fenimore Cooper’s Red Rover. Linda Chaikin’s Buccaneers series. Myriads of teen novels. Errol Flynn films. Pirates of the Caribbean (I suppose the setting more than anything else is why I’ve seen all four). Though I rarely paint anymore, ships have been a reoccurring motif in my art for some time. Ships in the sky, on the ocean, surrounded by hostas, worked in relief on clay, and sailing through a psychological self-portrait. Strangely, I’ve never written a story with ships. Perhaps that will change now that I’ve been on board a ship. There were eight ships at the festival, and we toured three: the Denis Sullivan, The Niagara, and The Unicorn. We didn’t leave the dock or see them under sail (that cost a lot more than we were prepared to spend), but it was so cool to be on the deck of a sailing ship and, in The Niagara’s case, below deck. I was surprised how short the space below deck was — I’m only 5′ 6″ and I had to bend over to walk around down there. 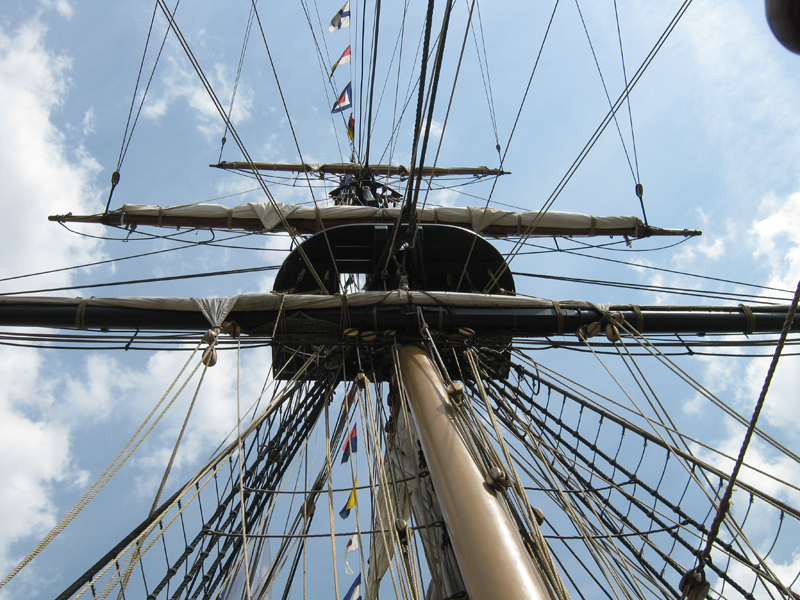 The Niagara is a training ship used to preserve “the skills of square-rig seamanship.” You can pay to become a trainee on board the ship, learning the art of sailing hands-on for a minimum of three weeks. It costs a little more than I can afford while looking for a car (mine died about a month ago), but part of me wonders if putting up with the authentic/spartan living conditions would be worth it for the chance to go to “sea” (on the Great Lakes). 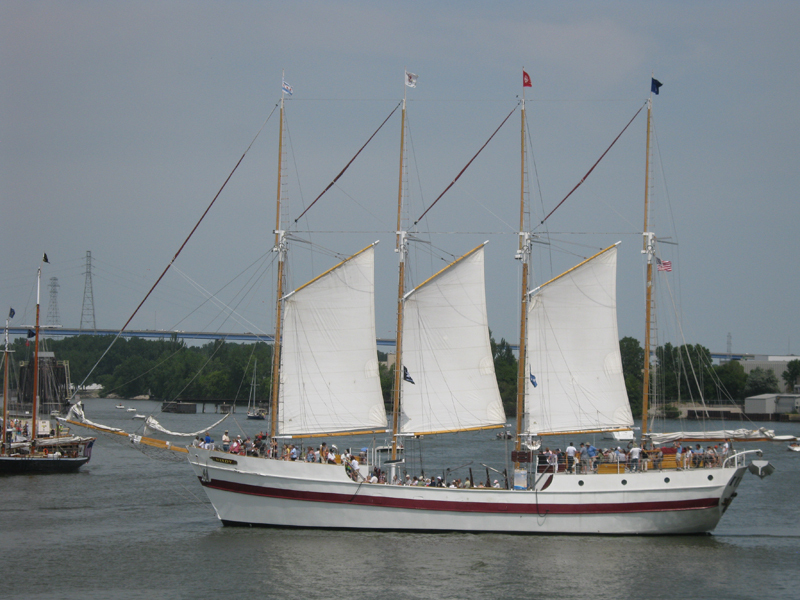 I’m not sure what make tall ships so appealing to me. Perhaps it is the romance of the sea and idea of adventure. Maybe its my obsession with water. Part of it could be the way the ships look, like so many old things they are elegant and beautiful as well as useful. Whatever the reason, I’m glad I had the chance to tour these ships and hope someday I’ll be able to actually sail on one.